Just wanted to pop in quick today and share a card that we did for our Oct Coffee Cards and Biscotti Class this past week. 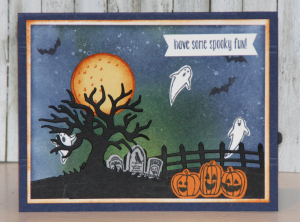 Studio has been in full fall crafting swing and this was a sweet little card that we did at class. I had intended to have a separate all Halloween class this month but with the remodel and soccer, my time slipped away. I compromised with myself to "just" do Halloween/Fall cards at this weeks class and of course, if you happened to be a non-Halloween fan I had a "neutral" option as well. So here's the first card. We used the Northern Lights technique. And the "neutral" option. 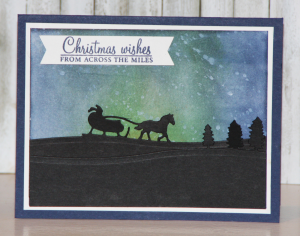 We used the retired Sleigh Ride Edgelits from last year. Don't forget to register for my November Coffee Cards and Biscotti Class. It's always a blast. Reserve your spot here!